BOXING, MARTIAL ARTS, TRAINING , FITNESS. 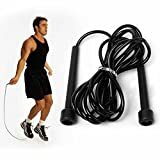 PLASTIC SKIPPING ROPE IN BLACK COLOUR Solid Poly 5mm vinyl rope fitted with ergonomic handles, widened at the bottom ensuring you grip the handle correctly and skip from the wrists the natural way to skip. handles are more durable and easy to grip which provides smoother spinning and skip.Ideal for improving cardiovascular fitness and toning muscles all over.